Honda adds to its arsenal of hot-selling and award-winning SUVS with the versatile, stylish, and fun-to-drive 2016 Honda HR-V Crossover for sale in Phoenix at your Valley Honda Dealers. The HR-V has caught the eye of both automotive experts and the buying public much like its sibling, the 2015 Honda CR-V did last year, when it won Motor Trend’s coveted “SUV of the Year” award. The new 2016 HR-V slots in perfectly behind the CR-V and the larger, recently updated Honda Pilot regarding size and price in the Honda lineup. Based on the fuel-efficient Honda Fit platform, the HR-V offers excellent fuel economy, spirited performance, and surprisingly ample room for passengers and cargo. In fact, The HR-V’s diminutive exterior dimensions don’t diminish its ability to transport a family and their gear across town or on a weekend getaway comfortably. Quite the contrary. On the outside, the new 2016 HR-V wears a set of chic new clothes that emphasize its youthful and sporty personality. Marty Padgett with TheCarConnection.com calls the HR-V’s exterior styling “exuberant.” Premium touches such as large LED brake lights, available heated side mirrors with built-in turn signals, and handy available integrated roof rails are just some of the many features that set the HR-V apart. Smartly styled projector-beam headlights, an athletic front grille and lower fascia, expressive wheel arches, and 17-inch alloy wheels complete the HR-V’s sporty look. Honda engineered the HR-V to epitomize interior versatility with multiple seating and cargo configurations. If you need to haul more gear than people, then “Utility Mode” obliges. Fold down the HR-V’s exclusive 60/40-split Magic Seat® with one motion, making it flush with the floor without having to remove the head restraints. Now you have plenty of room to transport those larger items, like small tables and chairs. The Magic Seat also has some other handy tricks up its sleeves. In “Tall Mode,” the bottom cushion of the Magic Seat flips up and out of the way so you can stow those items that need more vertical space, like that new potted plant for the backyard. In “Long Mode,” the passenger seat folds forward and the rear Magic Seat folds flat, letting you load in up to 8 feet of cargo. Kayaking anyone? You’ll also appreciate the many upscale appointments and convenience features that you’d expect to find on cars costing much more. Take the HR-V uptown with available leather-trimmed and heated front seats. 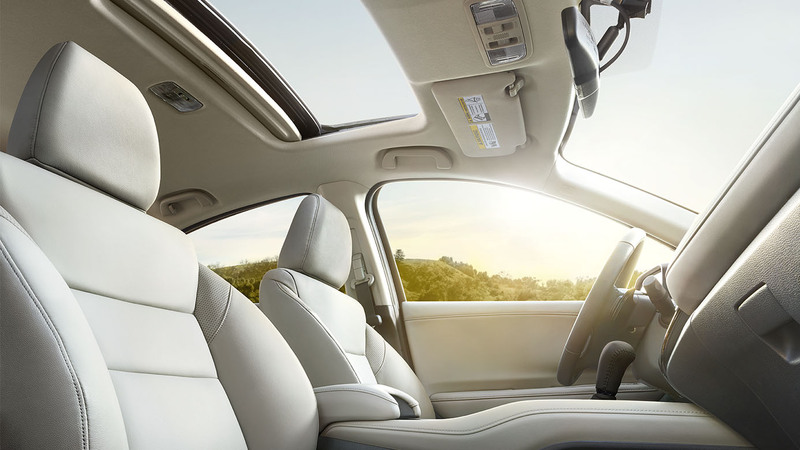 Available automatic climate control keeps everyone comfortable even on the hottest Arizona days. Enjoy a breath of fresh air with the available power moonroof. The HR-V’s Smart Entry system lets you lock and unlock the doors, as well as start the vehicle without the key fob leaving your pocket or purse. The HR-V’s contemporary and ergonomically designed cockpit features a sporty three-spoke steering wheel with fingertip controls for audio, cruise, and hands-free calling. A three-gauge sports instrument cluster and sports shifter add to the HR-V’s playful attitude. Interior materials are of high quality, as you would expect from Honda. Controls and switches are easy to use and easy to reach, enhancing the driving experience. The HR-V also comes equipped with plenty of technology capabilities to keep even the most tech-savvy member of the clan happy. Such things as a responsive 7-inch color touchscreen display let you command audio, navigation, connectivity, communication, and other functions with ease. The HR-V comes equipped with standard Bluetooth® Streaming Audio and a handy USB audio interface port. You can add PANDORA®, SiriusXM® Radio, HD Radio®, a rocking 180-watt, 6-speaker audio system, and navigation on upper EX and EX-L trim levels. You can also use Bluetooth Hands-FreeLink® to connect calls and SMS Text Messaging to have your texts read to you aloud. Plus the available HondaLink® Next Generation lets you pair compatible smartphones and access your music playlists, podcasts, schedule service, and much more. Not only will you love the HR-V’s innovative versatility, stylish good looks, and an array of high-tech features, you’ll also love how fun it is to drive. Honda packs a ton of crisp handling and steering, and brisk performance into the HR-V’s urban-friendly package. It proves that just because you going small in stature doesn’t mean that you can’t go large when it comes to accelerating your driving enjoyment. The HR-V puts a spring in your daily commute or vacation getaway with a lively and responsive 1.8-liter, 141 horsepower 4-cylinder engine that has plenty of ponies for passing, merging, and get up and go. It’s mated to an efficient continuously variable transmission (CVT) or 6-speed manual transmission. And you’ll spend less time at the pump and save some cash thanks to the HR-V’s thrifty fuel economy. According to EPA estimates, you’ll get up to 35 mpg highway and 28 mpg city depending on the particular model and engine/transmission configuration you select. The HR-V’s suspension is calibrated to offer a confident, compliant ride just a tad on the sporty side without feeling too jittery. The optional all-wheel drive provides an enhanced level of surefooted control under varying road and weather conditions. The world’s a dangerous place, and that’s why keeping you and your passengers safe is a priority at Honda. You’ll find an array of cutting-edge passive and active safety technologies on the HR-V that help keep you more secure with every mile you drive. That’s why Honda was one of the first automakers to offer a standard rear backup camera with sight lines on all its vehicles, including the HR-V.
Honda’s exclusive “Honda Sensing™ safety suite includes such key features as Lane Departure Warning, Collision Mitigation Braking System, and Forward Collision Warning. You’ll also appreciate these important additional safety features that include a tire pressure monitoring system, daytime running lights, ACE™ body structure designed to distribute frontal crash energy more evenly, dual-stage, multiple threshold front airbags, Vehicle Stability Assist™ with traction control, and anti-lock brakes. These are just some of the reasons why the new HR-V earns top safety scores from major government and auto industry safety rating organizations such as the IIHS and the NHTSA. When you add it all up, it’s clear to see that Honda has another winner on its hands with the new 2016 HR-V Crossover. If you’re looking for a compact SUV that gives you all you could ask for in versatility, sportiness, fuel efficiency, and technology, then you owe it to yourself to visit one of our conveniently located Valley Honda Dealers in Phoenix and take one for a test drive. Click here to find a Valley Honda Dealer near you.